The famous iconographer Theophanes the Greek painted this icon in 1403. The three favored Apostles who usually came with Jesus apart for the deepest spiritual events, SS Peter, and James and John, sons of Zebedee, were with Christ on this memorable day at midnight when Christ had taken them up on the mountain. There He was transfigured before them, so that they would know later that His death was voluntary, and that He was conscious and aware of the Glory that He always had with the Father, even though He would suffer and die in the days that would follow. These three Apostles are overcome with fear and wonder, falling to the ground when they behold the Light of the Transfigur-ation of Christ shining all around them. Above them and to either side of Christ are the Prophets Elijah (or Elias) and Moses, representing the Law and the Prophets, talking with Jesus as He prepares to enter His Passion, Torture, and Death for our sakes. Underneath them on either side, the Lord leads His Disciples up Mount Tabor on our left and down the Mountain on our right. 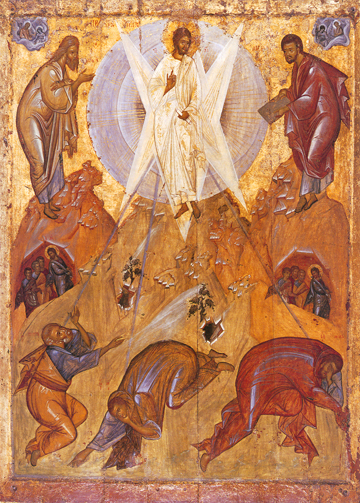 May we be transfigured, too, with Christ, and enter this Divine radiance.